Authors of papers submitted and accepted after January 1, 2016 must archive the data used in the paper in a permanent repository as spelled out in our data archiving policy. For guidance on how to prepare your data for archiving at the Dryad Digital Repository or other repositories we suggest the following resources. Data from Bruna et al. 2011, PLoS ONE: Link to Dryad data summary and data files. A template (in .txt) of a metadata file that you can download and use for your own data files. Data can be submitted in any non-proprietary format. Files in .csv and .txt format are preferred. GUIDELINES ON THE BEST FORMAT FOR YOUR DATA AND METADATA, including how to format dates, numbers, null values, column headings, etc. These are excellent, straightforward introductions and we request that you submit data following these guidelines. Start here: Borer, ET, EW Seabloom, MB Jones, and M Schildhauer. 2009. Some simple guidelines for effective data management. Bulletin of the Ecological Society of America. April(2009): 205-214. [if you can’t get access you can request a copy from Dr. Borer via email. Cook, RB, RJ Olson, P Kanciruk, and LA Hook. 2001. Best practices for preparing ecological data sets to share and archive. Bulletin of the Ecological Society of America 82(2): 138-141. White, EP, E Baldridge, ZT Brym, KJ Locey, DJ McGlinn, and SR Supp. 2013. Nine simple ways to make it easier to (re)use your data. Ideas in Ecology and Evolution 6(2): 1-10. Strasser, C, R Cook, W Michener, and A Budden. 2012. Primer on Data Management: What You Always Wanted to Know. A DataONE publication (California Digital Library). Karl Broman has some excellent, easy to implement suggestions that for organizing data on his webpage. Software Carpentry has an excellent series of short lessons for ecologists on formatting the data in spreadsheets. Michener, W.K., Brunt, J.W., Helly, J., Kirchner, T.B., Stafford, S.G., 1997. Non-geospatial metadata for the ecological sciences. Ecological Applications 7:330–342. Highly recommended: Goodman, A, A Pepe, A Blocker, C Borgman, K Cranmer, et al. 2014. Ten Simple Rules for the Care and Feeding of Scientific Data. PLoS Computational Biology 10(4): e1003542. The British Ecological Society has written an excellent Introductory Guide to why data archiving and management are important with some suggestions for getting started. Whitlock, MC. 2011. 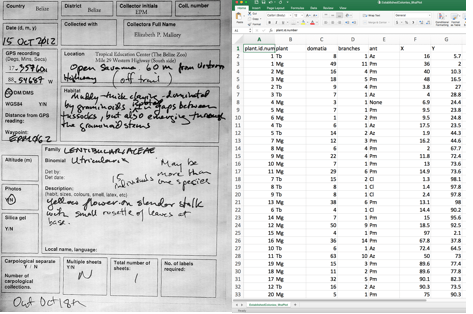 Data archiving in ecology and evolution: best practices. Trends in Ecology and Evolution 26(2): 61-65. A list of readings and blogposts curated by the California Digital Library. Photo of datasheet by E. P. Mallory (CC BY-NC 2.0). Photo of Data File by E. Bruna (CC BY-NC 2.0).